Barely 48 hours after members of the International Society for Social Justice and Human rights staged a peaceful protest calling for redeployment of Obo Effanga, the Resident Electoral Commissioner, for INEC, Leaders and members of 85 INEC Registered Political Parties under the aegis of Inter-Party Advisory Council (IPAC) on Wednesday, March 27, marched through the streets of Port Harcourt, urging the Independent National Electoral Commission ( INEC) to retain its Resident Electoral Commissioner in a counter peaceful protest. The IPAC members called for the official conclusion of the official Collation and Declaration of the State Governorship Election and declare Governor Nyesom Wike winner. They gathered at the Isaac Boro Park in Port Harcourt by 7.30am declared that the Peace Walk was aimed at telling the world that Rivers people irrespective of political affiliations voted overwhelmingly for Governor Wike on March 9, 2019. Unlike members of the International Society for Social Justice and Human rights led by Comrade Omenazu Jackson, who warned that crisis is looming in the State if Governor Wike is declared winner when suspended election is concluded, Obo Effanga left on INEC saddled, the IPAC members sang pro-Wike songs as they marched through the streets insisting that on no account should the votes of Rivers people be manipulated. They passed a vote of confidence on the INEC Resident Electoral Commissioner in Rivers State, Obo Effanga. 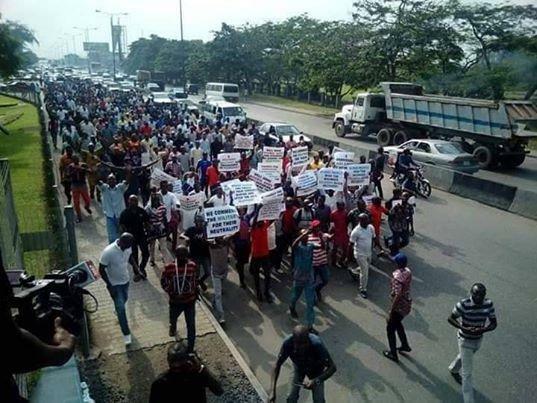 The Protesters displayed several placards indicating their preference for Governor Wike and the need for the Collation Process to be concluded as outlined in the timelines of INEC. Some of the placards read: “Army Stop Disrupting the Collation Process in Rivers State “, “Army Please Allow INEC Conclude the Collation Process “, “Rivers People Overwhelmingly Voted for Governor Wike on March 9”, “We Shall Continue to Defend our Votes” and “Obo Effanga is a Professional and We are confident in his capacity to deliver “. The peaceful march moved to the Rivers State Police Command where the leaders of the 85 Political Parties relayed the position of the people. In his address, Chairman of IPAC Rivers State, Mr. Precious Baridoo said that the political parties are calling on INEC to continue with the Collation and Declaration of the Governorship election results. He said: “Let the election process continue in Rivers State. We are telling INEC to follow through with the process. We condemn in totality, the calls by a few persons for the removal of the Resident Electoral Commissioner, Obo Effanga. We want him to continue and conclude his job”. The Chairman of IPAC Rivers State noted that nothing should be done outside the law because the INEC process is constitutional. He said: “INEC process is constitutional and must be allowed to take place. It should be done normally for the peaceful co-existence of Rivers State “. He claimed that Rivers people have voted for Governor Wike and their votes will count as the Collation Process is brought to a logical conclusion. Responding on behalf of the Rivers State Police Command, Assistant Commissioner of Police, Victor Erewere commended the members of IPAC for their peaceful conduct. He said that he will convey their message to the appropriate authorities for necessary action. The procession later moved to the Rivers State Headquarters of the Department of State Services (DSS) where they reiterated their demands for the conclusion of the Collation and Declaration of the Governorship Election results of Rivers State. In another part of the state capital Port Harcourt, and for the second time within 48 hours, Comrade Omenazu Jackson, also today led members of his group; the International Society for Social Justice and Human Rights on another peaceful protest simultaneously on the Port Harcourt/Aba Expressway to the 6 Division of the Nigerian Army to commiserate with the Army for deaths and injuries suffered by some Soldiers during the general elections. Jackson said the group had come to apologize and pledge support for the Army on behalf of Rivers people and condemn the disparaging remarks made by some political stakeholders in state against the Army before, during and after the elections. He said without the interventions of the Army, the violence that characterised the elections in the state would have been worse. They carried placards such: “Diligent Military As safeguard to democracy “,” 6th Division Nigerian Army “,” Rivers people wish wounded Soldiers quick recovery”, Rivers people are proud of your conduct during and after elections “,and ” Without the Military our Blood will flow like water in Rivers State ” and others. Pro-6 Division Nigerian Army by Coalition of Human rights group, APC supporters with placards. “We are here and alive because the military gave all us security cover and protection from the rampaging political thugs clothed in Army uniforms and armed to the teeth. ” For a security institution, like the Army shouldn’t have been disparaged for mere selfish political reasons. We are using this opportunity to tell the 6 Division of the Army that we are sorry for the unguarded statements by some of our political leaders against the military institution in the state. “We also commend the GOC, 6 Division of Nigerian Army for subjecting itself to the civil authorities thereby aiding and deepening the democratic culture in Nigeria”. The leader of the Protesters delivered a letter to the GOC 6 Nigerian Army but received on his behalf by Colonel A. D. Abubakar on his behalf. Our Correspondent noted, however, that besides the disruption of economic activities for a few hours at the different parts of the state capital, the two counter-protests were peaceful.